Stylish is a user style manager that can change the appearance of web pages in a user's browser without changing their content by including user-supplied CSS style sheets with those supplied by the web site itself. The Stylish browser extension includes tools with which to write user styles, and can install user styles written by other Stylish users from a companion website. These user styles may be more or less selective, targeting just one web page, or all of the pages on a domain, or every page on the web. Stylish was originally developed by Jason Barnabe as an XUL/XPCOM add-on for Mozilla Firefox. A Chrome extension followed in 2010, which was released for Blink-based Opera 15 in 2013 and as a Firefox WebExtension in 2017. Similar extensions for Safari and for Presto-based Opera are distributed as 'Stylish' by other developers with Barnabe's approval. User styles are CSS code designed to alter the appearance of one, some, or all sites. Stylish for Firefox can additionally style the skin of the browser itself, but the Android version does not support this because the user interface is built in native Android code. The styles are applied only to the targets specified. Individual user styles can be enabled or disabled without having to restart the browser. User styles are added to the CSS rules provided by the site, but can also override the site's styling (often requiring the !important keyword for each replacement rule). The most common uses are ad blocking, applying a new color scheme, and eliminating unwanted page elements. There are three classes of user styles. Site styles change the appearance of a particular web site. Global styles change the appearance of all web sites. App styles change the appearance of the Firefox user interface, only supported on Firefox. It is similar to the userChrome.css CSS file used by Firefox and Mozilla-based browsers. Since January 2017, following the sale of Stylish to Israeli company SimilarWeb, the extension has contained tracking functions that sends information on all visited URLs and HTTP requests, and information contained on search engine results pages, to SimilarWeb servers. In July 2018, after these issues were publicized by a software engineer, Stylish was pulled from both the Chrome Web Store and Mozilla Add-ons, as well as being automatically uninstalled for all existing users. 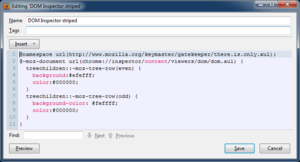 A userscript manager such as Greasemonkey or Tampermonkey can add a local style sheet to a web page by adding the style sheet content to an HTML <style> tag and adding the tag to the page. User styles from Userstyles.org can be downloaded as user scripts for use with a userscript manager. Alternative user style managers include Stylus and xStyle, which are derived from Stylish for Chrome, aStyle, reStyle, and Website Theme Manager. In Firefox, user styles for web sites and browser chrome can be added to local files userContent.css or userChrome.css, respectively. ^ Hindman, Justin (3 January 2017). "Announcement to the Community". userstyles.org. Archived from the original on 5 January 2017. ^ np [Jason Barnabe] (9 October 2005). "Stylish 0.1.1 Released [Oct 11]". MozillaZine. Archived from the original on 10 December 2005. ^ "Stylish - Custom themes for any website Version History". addons.mozilla.org. ^ "Stylish - Custom themes for any website". Chrome Web Store. ^ "Stylish extension - Opera Add-ons". Archived from the original on 30 January 2018. ^ Barnabe, Jason (1 March 2010). "Stylish for Google Chrome". Userstyles.org. ^ Barnabe, Jason (3 July 2013). "Stylish for Chrome and Opera (15+) 1.2b". Userstyles.org. ^ "Stylish extension - Opera add-ons". Opera Software ASA. Archived from the original on 25 April 2013. The oldest comment is dated July 26, 2013. ^ "New version for Firefox". userstyles.org. 2 November 2017. Archived from the original on 26 December 2017. ^ "Stylish - Custom themes for any website Version History". Firefox Add-ons. Mozilla. Archived from the original on 12 May 2018. Version 3.0.1 is the first Stylish for Firefox WebExtension release; version 2.1.1 is the last Stylish XUL/XPCOM add-on release. ^ Sobolev, Vladimir. "Stylish for Safari". ^ gera2ld. "Stylish for Opera". Opera Software ASA. ^ Barnabe, Jason (9 April 2014). "Stylish for Safari". userstyles.org. ^ Barnabe, Jason (1 January 2013). "Stylish for Opera!". userstyles.org. ^ "Make the whole Web look better with Stylish," Nathan Willis, Mon 7 May 2007. ^ Goodin, Dan (July 6, 2018). ""Stylish" extension with 2M downloads banned for tracking every site visit". Ars Technica. Condé Nast. Retrieved July 6, 2018. ^ Tung, Liam (July 5, 2018). "Use this popular Chrome, Firefox browser add-on? Google, Mozilla just banished it". ZDNet. Retrieved July 6, 2018. ^ Cimpanu, Catalin (July 4, 2018). "Chrome and Firefox Pull Stylish Add-On After Report It Logged Browser History". Bleeping Computer. Retrieved July 5, 2018. ^ Pilgrim, Mark (2005). 4.13. Adding CSS styles. Dive Into Greasemonkey.